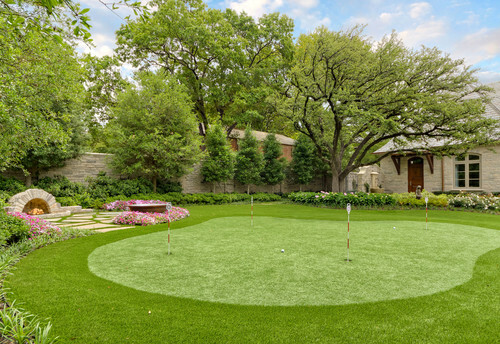 Backyard putting greens may seem like a luxury landscaping feature, but avid golfers are sure to appreciate just how convenient it would be to step outside and practice their short game without leaving the house. This just might lead to surprising your pals when you take a couple of strokes off of your game, and it certainly allows for a stress-reducing way to start or end your day. It is sure to impress guests at your next social gathering and will definitely be a hit when you invite your friends over for a weekend barbecue and some friendly putting competitions. While this may seem like a feature you would most likely see in the backyard landscaping of estate homes with expansive grounds, it actually does not take much space at all to include this as part of your home’s outdoor living area. A larger green will likely be more enjoyable and can have more features, such as sand traps, but even a small space can be almost instantly transformed into a backyard putting green. This means that you can find a spot even in a smaller yard or a yard that is fully landscaped. Since you can install a golf green that is just big enough to practice on a single hole or one that meanders through your property with multiple holes, this also means that a backyard putting green will fit into just about any homeowner’s budget. 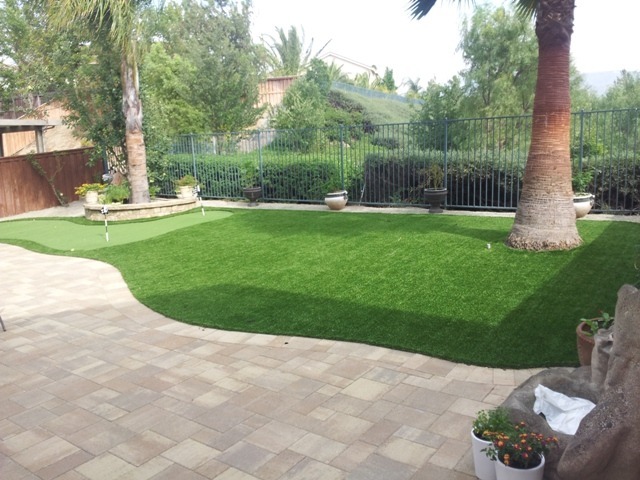 Once you have decided that it is time for you to treat yourself to your very own green, you will need to decide between natural grass and synthetic turf. Both options will need to be installed by a professional, and homeowners who are not well versed in putting green installation will likely be disappointed with the end product if they try to make this particular landscaping feature a do-it-yourself project. To help you determine which option is right for you, here are nine important points to consider. Contemporary Landscape by Van Nuys General Contractors Kasis Construction Inc. There are several factors that go into determining the cost of designing and installing a golf green constructed of either material, including who you hire, the prep work required, the complexity of the design and your geographical location. If you are installing a small, flat green with few features, the cost of initial installation will likely be lower if you opt for natural grass, but this is not always the case. However, you do not have to wait for your synthetic turf to grow. The health and beauty of natural grass is dependent on environmental factors, such as soil condition and the amount of sunlight it receives. This means that you cannot expect to grow a successful natural grass lawn in shady areas or soil that might not have the right consistency or nutrients. On the other hand, synthetic turf can be installed almost anywhere, requires no sun and does not depend on things like nitrogen or phosphorous to look its best. This means you can install your golf green under a shade tree, in a side yard that does not receive much sun or in a section of your yard that does not have good soil. This ability to put your putting green almost anywhere makes fake grass the winner here. Backyard golf greens are rarely separated from the rest of the yard by a fence or wall, so if you have a dog, you can be fairly certain that you will be sharing your putting green with him or her. This could mean that your dog may use your green as a restroom, will probably play on it and might even try to dig. A natural grass lawn will almost always get brown spots in places where dogs urinate even somewhat frequently. Your dog may also accidentally kick up clumps or make holes and divots while running or playing on natural grass. And it probably goes without saying, but if your dog decides to dig up your putting green, it could be completely destroyed or, at the very least, require professional repair. Your dogs can urinate on artificial grass as much as they please without causing unsightly brown spots, and you will not have to worry about clumps of grass that could trip you or ruin your practice session. Dogs are also less likely to try digging once they realize that fake grass does not easily give way to expose the dirt in which they really want to dig. It is true that synthetic turf can get hot in direct sunlight and in particularly hot areas, so if you choose artificial grass, you will want to make sure that your pets have other options for places to hang out on hot days. When you practice your short game on natural grass, you will likely get your shoes dirty and may track dirt, mud and grass into your house. Your children or pets may also track in these materials if they play or walk through your green. Choosing natural grass also means dealing with muddy patches after rain. This is not an issue with synthetic grass, which makes it a clear winner when it comes to cleanliness. Conventional lawns require quite a bit of upkeep, and natural putting greens require even more. Any installation of conventional grass requires regular watering, weeding, fertilizing, aerating, edging and mowing. You may also need herbicides and pesticides to keep weeds and pests at bay. This means that there are plenty of products and equipment to purchase, hours of maintenance each month, higher water bills, and gasoline or electricity requirements that come with having a natural grass lawn. But when you are using that grass as a putting green, all of this must be taken to the next level to ensure a proper surface for your practice sessions. Artificial grass is a completely low-maintenance option that requires very little work or water to look its best. You will likely want to rinse it down every once in a while and brush it up occasionally to keep the blades looking lively, but that is about all it takes to have beautiful grass in your backyard. Check out The Ultimate Guide: How to Properly Clean and Maintain My Artificial Grass to learn just how easy it is to keep manufactured turf looking lush and verdant. As mentioned above, artificial grass will hold up to things like pet urine and roughhousing much better than natural grass. It also will not experience the same broken blades or trampled look after your children or pets have run across it or played on it. There will be no dead or bare areas from too much activity. While all of the above is an issue with conventional grass, perhaps the most important aspect of durability regarding putting greens is the fact that natural grass will get ruined over time from repeatedly being dug up by your putter forming divots. Now this is not to say that you are not a great golfer, but you and I both know that even the pros leave behind a few divots sometimes. Those spots in your grass will never again be the same, even if you carefully replace the clump. This is going to take away from that perfect, seamless look that you want in a backyard golf green. 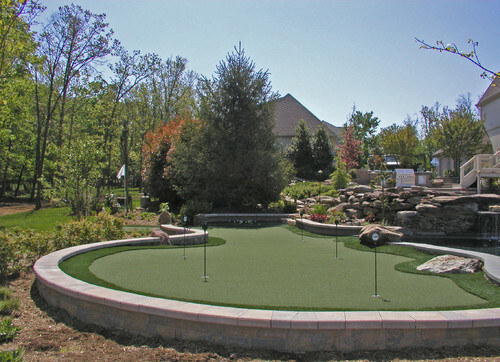 An artificial grass putting green allows you to practice your swing at will without worrying about ruining your lawn. The golf community is a bit torn on this one. Many golfers prefer natural grass, but you might be surprised at just how many PGA pros endorse synthetic grass and state that it plays like conventional grass. One thing to keep in mind is that it is one thing to spend an afternoon on a golf course and quite another to practice your short game in your backyard. The cost of converting entire courses to fake grass can be prohibitive, which means lots of folks are still used to playing on natural grass at their country clubs or favorite golf courses. But this is changing, particularly in drought-ridden areas like Southern California where more golf program directors are replacing all or part of their greens with manufactured turf. One of the reasons clubs and courses are taking this step is because of the advances made in artificial putting green turf, which allows for a proper roll. Additionally, you can play on a synthetic green any time. You do not have to worry about mud after the rain or whether or not you had time to mow it that week. There are advocates on both sides of the fence when it comes to which surface is safer for sports fields and play areas. You can rely on synthetic turf to provide an even, consistent playing surface without holes, clumps or divots. Natural grass is sure to get the divots mentioned above, and it is very difficult to avoid holes and an uneven surface. This can be due to regular wear and tear, pets and children playing on it, your grass’s response to rain and other environmental factors or, simply, the way that natural grass grows. Therefore, artificial grass is generally considered the safer option in terms of avoiding tripping hazards and maintaining an even surface. Where the debate comes in is when running or playing active sports on the surface. Studies have varied results with some finding artificial grass to be safer, some finding natural turf to be safer and some determining that they are pretty well matched when it comes to safety. However, practicing your short game does not require running or strenuous activity, so tripping hazards are probably the most relevant concern for backyard greens. Either of these options can have tripping hazards if the base beneath the grass is not properly prepared or if they are not correctly installed. When correctly installed and maintained, synthetic turf provides a consistent, even surface without the tripping hazards commonly found with natural grass. When perfectly manicured, conventional grass can be quite attractive; however, it takes a lot of time, effort and money to keep natural turf looking its best. This is particularly true in the case of putting greens, which require special care when constructed of natural grass. Too much water, too little water, not enough sun, improper fertilization, weeds, traffic, pets, putters and several other factors can quickly ruin the look of conventional grass. With artificial grass, you can always rely on it to look lush and green with no weeds, brown spots, bare spots or divots. 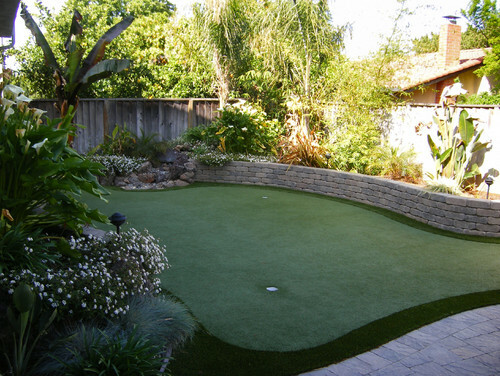 Would you choose natural grass or artificial turf for a backyard practice green? And, of course, why?